An orchard of crab apples, a grove of sugar maples, even a hayfield — pastoral landscapes don’t get more idyllic than this. 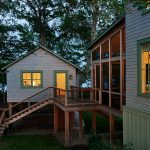 When two retired teachers built their dream home, their property was basically two acres of mown grass. 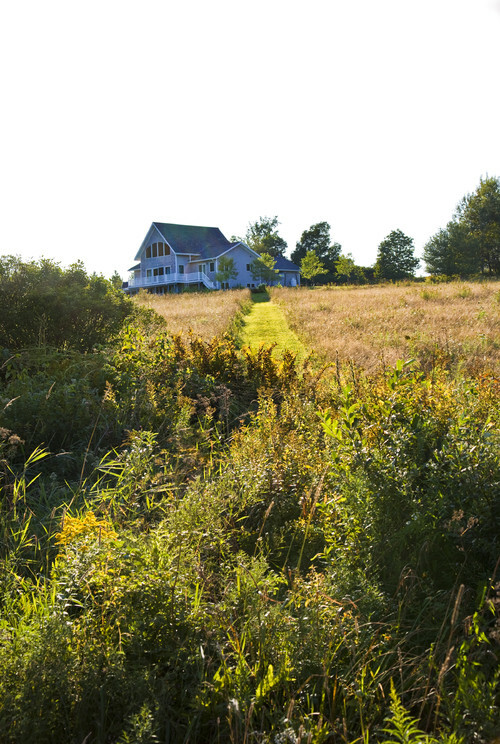 The couple loved their pastoral Maine landscape, but they were not interested in mowing two acres every week. So they called in landscape architect Matthew Cunningham to create a lower-maintenance environment and help their home fit in better with the rural site. For inspiration, Cunningham looked to the surroundings and to good old-fashioned land management techniques. 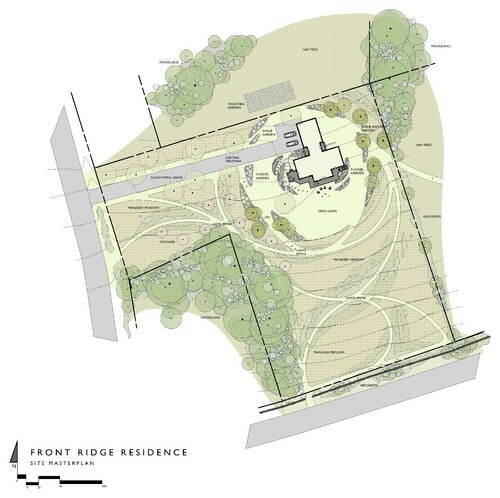 Important aspects of the design included restoring the large meadow to its naturally wild aesthetic, embellishing the panoramic views, ringing the house with gardens, and creating a playful arrival sequence from the road to the house. 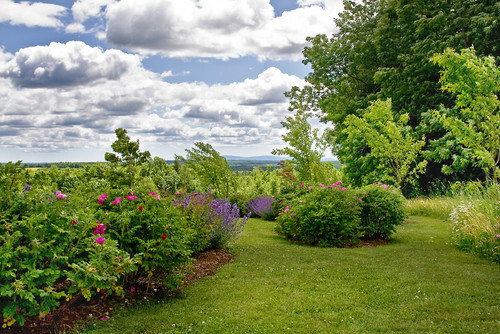 Plantings were chosen with color and seasonal interest in mind, and newly carved paths allow the clients and their Lab, Kuli, to travel by foot to see their nearby children and grandchildren. 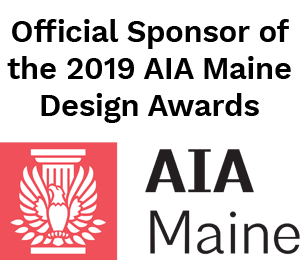 That’s interesting: The clients taught their landscape architect algebra in high school. 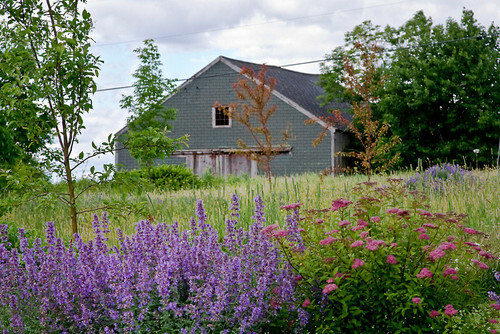 An ornamental crab apple orchard has been planted in front of the property’s original barn; a perennial border in the foreground includes catmint and spirea. 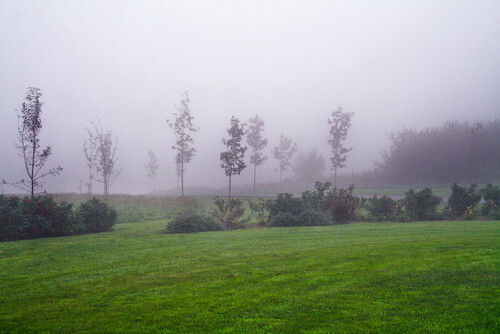 “We allowed former lawn areas to regenerate into manicured meadows,” explains Cunningham. The native plants that returned include rushes, clover, grasses, daisies, Queen Anne’s lace, thistle, goldenrod, rue, vetch, lupine, buttercups, and more. The area shown is a hayfield that is mown and mulched once a year. While the couple’s home is new, its style gives a nod to the region’s farmhouses. 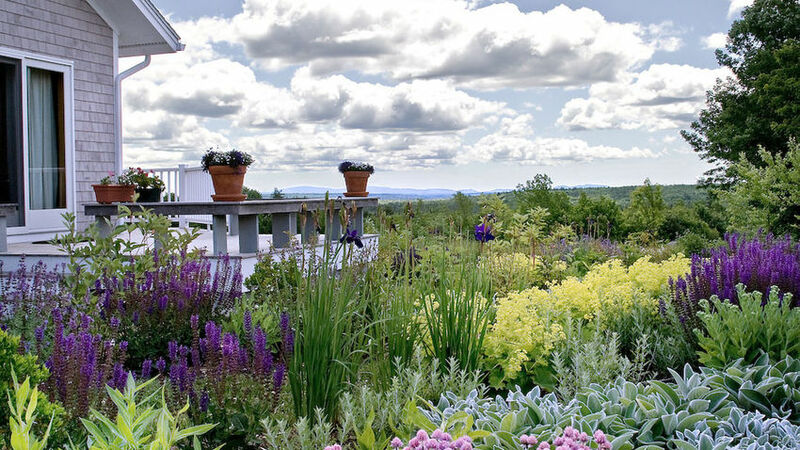 “Shrub and perennial borders around the house draw the eye in,” Cunningham says, creating soft edges and thresholds between the domestic part of the yard and the meadow. While the gardens are designed, the mix of textures, colors, and species gives them an informal look. 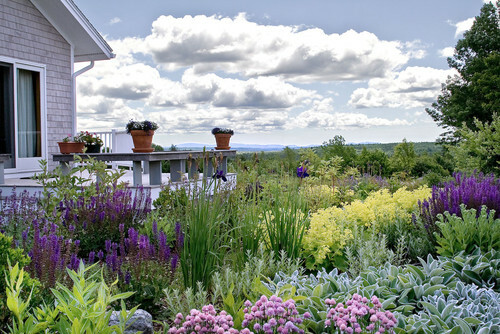 Cunningham has been gardening in Maine since he was nine years old, so choosing plants for this project came naturally. 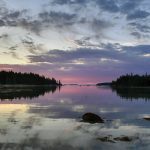 The palette is predominantly purple, green, silver, and pink during spring and summer and transforms into yellow, orange, rust, and cranberry-red in the fall. “The garden still looks great when the first frost hits,” he says. This border combines forsythia, red twig dogwood, iris, hydrangeas, lilacs, rugosa roses, coneflowers, spirea, and daylilies. 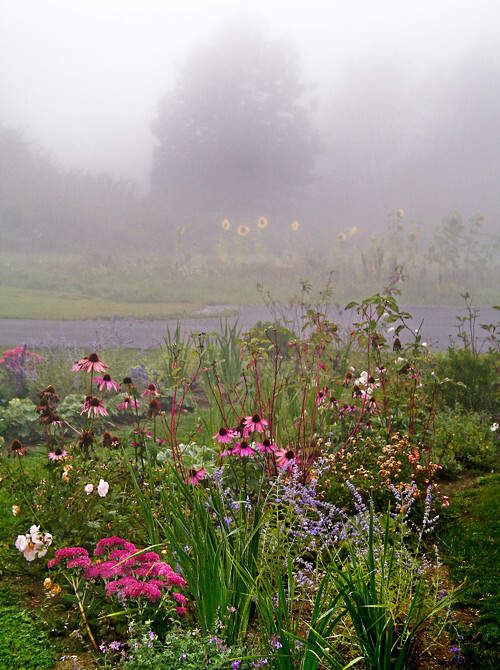 Look closely and you can also see bright sunflowers through the fog. They are part of the clients’ vegetable garden. “Because the clients’ driveway is basically a straight line from the road to the house, I added a grove of sugar maples to create a playful arrival sequence,” says Cunningham. “This region is blanketed in fog about a third of the time, so I also chose the maple trees for their interesting silhouettes.” In addition, sugar maple leaves turn fiery red in the fall. Other parts of the property include very lightly managed woodlands. This means the forests were cleaned up and their edges are maintained via the annual hayfield mowing. The clients allow natural succession to continue within the woods. 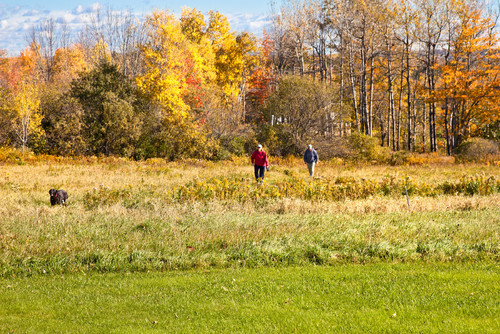 Paths carved through the meadow were an important part of the master plan, as they connect the couple to their children’s properties nearby. “While there is not much traffic on the surrounding roads, people tend to drive too quickly on them,” says Cunningham, who photographs his projects during different weather conditions and seasons. This image gives you a glimpse of the oak, maple, and ash trees in fall. The master plan shows how the mown lawn, perennial gardens, and shrub borders casually delineate the domestic portion of the yard. You can also see the importance placed on the paths and trees. 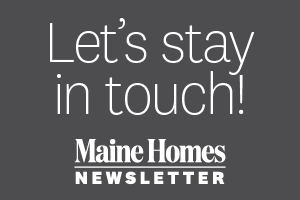 Now that the installation and cleanup phases are complete, the owners can enjoy a beautiful, functional landscape that embodies the qualities they love about Down East Maine. Thank you for the wonderful suggestions for a low(er) maintenance landscape. I have Approx. 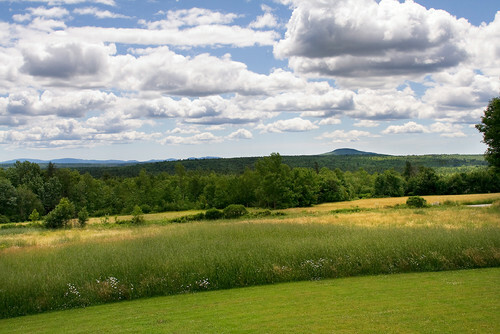 an acre of land –partially rocky, boggy and grass that has to be mowed. 1/3 is now meadow however, the other boggy 1/3 has grass that is growing to unmanageable height—therein lies the problem. Only the front yard can be maintained.